The Aeon Labs 4 in 1MultiSensor looks like a motion sensor and acts like one too. But it’s also so much more. Placing this one piece of Z-Wave technology either in the corner of a room or outside is the same as placing 4 pieces of Z-Wave technology. But those 4 pieces of technology, those 4 pieces of intelligence that you can bring to your Z-Wave network, all live within a single, stunning sensor. 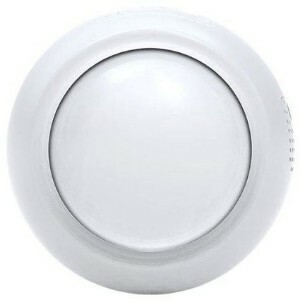 Most motion sensors are used for security only, but with MultiSensor and the power of Z-Wave you can design all manner of intelligent scenarios from lighting control to the expected security monitoring. Monitor the temperature of a space and then use the power of MultiSensor to directly control, or get your Z-Wave system to control, the devices that’ll keep you comfortable. Temperature sensing is one thing, but humidity sensing brings a whole new level of intelligence to your home. Use it with Z-Wave to create the perfect, most comfortable spaces possible. Energy saving, safety, comfort. There a lot of things you can do with MultiSensor’s inbuilt light sensor, each of them offering an whole new level of intelligence, personalisation and perfection for Z-Wave. Whether it’s for comfort or security, attach it to a wall, sync it, and MultiSensor instantly provides your Z-Wave network with 4 unprecedented levels of intelligence. Your Aeotec MultiSensor isn’t limited to the corner of a room. Designed to withstand the elements, MultiSensor brings the outdoors to your Z-Wave network. You can affix MultiSensor to your wall or ceiling with no more than a few screws. No wires. Nothing. MultiSensor can be a truly wireless sensor with batteries that’ll last a year and the reliability of Z-Wave’s wireless signal. Of course a device for your wall made with just the right features offers more than just battery power. MultiSensor can be powered by mains electricity using a power adaptor and the inbuilt mini-USB connector.